Whether you use it to receive clients or to get your team together, your meeting room is an often overlooked asset to your company. Throwing some spare chairs around an old table will get the job done, but to get the most out of your employees – and to give visiting clients the best experience possible – you need to create a purpose-built space that reflects your company. Companies that might want to consider creating an unusual meeting space include those in the digital, fashion and design industries. The offices of creative companies such as the Innocent Drinks Company or Google have become almost legends with stories of bean bags, vintage decoration and even slides between floors being reported. You don’t have to go this far to take a leaf out of their book – it could be as simple as adding a splash of colour with some artwork on the walls. You could also include a unique feature that adds interest to the room, which could be as simple as having each chair in a different colour. Don’t forget practicalities, though – do you really want to ask a client to sit on a squashy, cube-shaped stool that has no back? Alternatively, you could create a cosy space with armchairs, rugs and old-fashioned decorations for a homey atmosphere. In a creative industry, comfort may also help the more shy employees feel at home and is likely to allow for a freer exchange of ideas, helping along any brainstorming sessions. If your industry and/or branding is a little more professional, perhaps involved in law, finance, sales, etc., then a fun meeting room is unlikely to impress visitors or inspire your employees. A more traditional space should be created, using clean lines and modern furniture rather than squashy armchairs. An easy way to create a classy space is to think about the materials your furniture is made of – glass tables (if kept clean) look great, or if you choose wood, make sure everything matches. Staying away from ‘quirky’ design doesn’t mean you are limited to grey and white – you could incorporate the colours of your brand and logo by choosing furniture or artwork in those colours, so that the company is fully represented by the meeting room. You’ll have to think very carefully about what colour your room will be in order to promote a productive atmosphere, though. Once you’ve decided on your approach, you’re ready to start designing your meeting room. If you need used or new office furniture in Bristol then get in touch with us on 0117 955 3668 and we’ll help you design your perfect meeting room. Wrights Office Supplies are an online office supply shop based in Darlington. 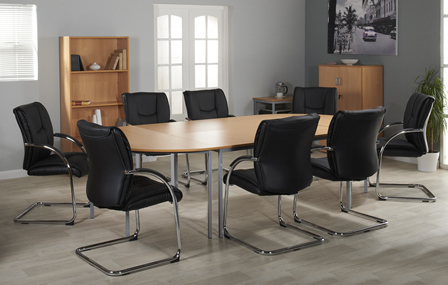 We offer a wide range of office furniture, equipment and supplies at http://www.wrightsoffice.co.uk with delivery available throughout the North East and beyond. For information about any of our Office supplies call 01325 462472.